Certificate of Appreciation from Veteran's Haven North for my 2018 music performance. 2018 Hunterdon Happening's "Most Happening" Entertainer! 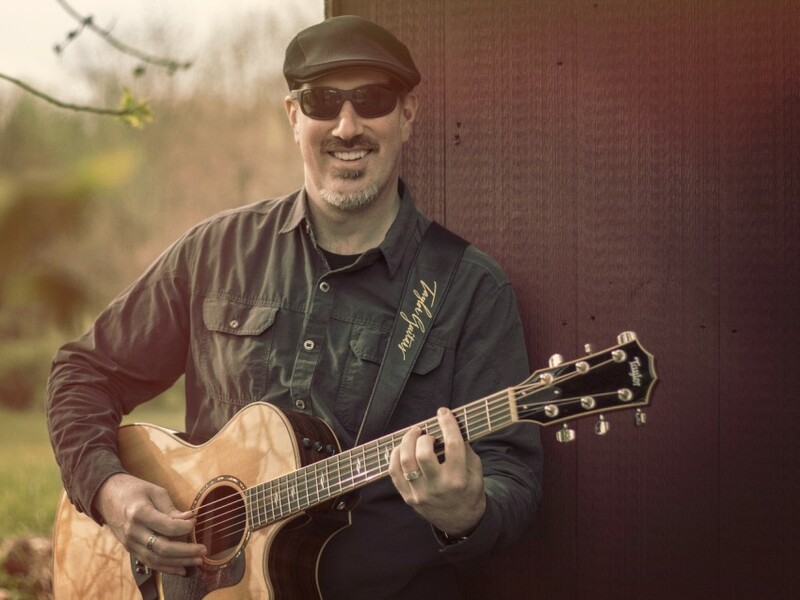 I am a solo acoustic guitarist and vocalist with vast experience performing an eclectic mix of cover songs. I have experience in playing private and public parties, including weddings, cocktail hours, corporate events, fundraisers, bars, restaurants, cafes, and car shows. My love of music and positivity are infectious and come across in my performances. I’m happy to provide background entertainment or be a feature, whatever you need. I can also provide duo, trio, or any configuration of band entertainment, as well as original music, just let me know! Fantastic performer and very professional. JT was excellent and provided the perfect entertainment for my birthday party. He really made the event extra special. He was quite attentive to my wishes and worked with me to make everything perfect. He even went out of his way to learn songs that I suggested! Don't hesitate to hire him for your event! A fantastic addition to our party! We had JT play at a surprise party that was held at home. He was a kind person, and very conscious of his audience and volume of voice being in this kind of setting. He was extremely professional and played music everyone loved and could enjoy. He was a great addition to our party! We were so pleased and hope to host another party that we will again book JT to play! John, and John, friend of John and fellow guitarist, gave completely of their enthusiasm for music at our party, performing a selection that included our requests, like the Beetles, Billy Joel and Ray Charles. The party was judged a success by everyone, and these two fellows were an important part. Man does not live by bread alone. John is proof of that. We had JT play for my 40th birthday at a vineyard and it was a fantastic evening. The music was perfect! It didn't overwhelm the crowd and was the perfect amibiance needed while everyone enjoyed their wine and appetizers. JT was a pleasure to work with! I hired JT to play my wedding a couple years ago. I knew he was EXCELLENT because I had heard him play back in my college days. Way back then, JT was the front man for the Rock-n-Roll Alliance, you may have heard of them. They were DYNAMIC for sure! I always loved his style, so I reached out to him on Facebook. He was receptive, and my wife and I were very pleased. We chose Sentimental Lady as our first dance song. It was a big hit and JT was spot on! I remember it like it was yesterday. Sentimental Lady was my only request. I was confident that JT would pick the right songs to fill the room and get the folks dancing. That's what he did. He played tunes from Elvis, the Cure, Stevie Ray Vaughan and Collective Soul...to name a few. He kept everyone dancing all night and played MUCH longer than I had asked. Call JT to make you wedding a Smash Hit! JT was outstanding at our surprise 25th Ann. wedding vow renewal and after party...He went out of his way to learn our wedding song. he is a very accomplished musician with a great personality. he interreacted well with our guest, trying to accommodate their requests.....he did such and outstanding job, and we got many nice compliments on the job he did. I am not really sure how to be concise about how amazing JT is an entertainer. He not only is super talented and accommodating, but one of the kindest people I have ever met. He was hired by our family to play at a surprise wedding vow renewal ceremony and party and was so responsive and helpful. He even took the time to learn my grandparents wedding song and play it for them as they walked down the aisle. I do not think there was a dry eye in the house. He plays the guitar beautifully, sings just as amazingly and will go above and beyond to make your event special, meaningful, and unique. We cannot wait to hire this awesome dude again!!! Thank you, JT, for a truly special job!!!!! You rock! Amazing 2 Years in a Row! JT has performed at my job's wine and beer fundraiser for the past two years and has done an amazing job both years! He provides the perfect ambiance for our crowd and we couldn't ask for better. JT Rooney is warm, friendly, and accommodating. His musicianship is superb, and is equaled by his attitude. Do not hesitate to consider Mr. Rooney for your event. JT was an excellent performer and crowd pleaser. Not only did he exceed all of our expectations in performance at our house party, he was also great to work with! I would absolutely recommend JT for entertainment at your next event! JT is one of my favorite local performers! Great song collection, fabulous energy and is a crowd favorite! I love how he is fresh and changes-up his performances, collaborates with other artists ...I feel like I get a "new" show each time! The choices in "event" below are limited. We are a Cafe, so I selected corporate--but he'd be great there too! You can expect professional level singing, guitar playing, and audio gear from me. I have an extensive and eclectic selection of cover songs and include something for everyone. I am courteous, professional, accommodating, and have experience in working with various audiences and events. I have been playing guitar and singing since a teenager. Performing and sharing music with others is a passion of mine. In addition to private events and playing at pubic venues, I also support local charity events and non-profit organizations. I strive to over-deliver and provide a personal and meaningful experience! I don't need much - technically a power outlet and a small area for me to perform in, and we're good to go! Unless otherwise instructed, I will provide my Bose L1 audio system (which requires less space and offers superior sound over a traditional PA system). If outdoors, overhead cover is appreciated. December 01, 2015 • 7:00pm - 8:00pm Please see http://jtrooney.net/gigs/ for all dates! To name a few in no particular order - Johnny Cash, Al Green, James Brown, Bruce Springsteen, the Beatles, the Rolling Stones, Frank Sinatra, Jimmy Buffett, Elvis Presley, the Pogues, the Dubliners, Bob Dylan, the Temptations, Curtis Mayfield, Funkadelic, Prince, Neil Young, James Taylor, David Bowie, Tommy Emmanuel, Danny Gatton, Steely Dan, the Kings - BB, Albert, Freddie, Bob Marley, the Great American Songbook, the Black Keys, the Grateful Dead, Waylon, Ween, Wilco, and Willie.